Description of "Exodus - Book One of the Mahabharata Simplified Series"
Meanwhile, in Mathura, the Yadavas face a constant threat from Jarasandha, the one who calls himself The Emperor, as part of his desire to have revenge since his son-in-law was killed by two mystical cowherds. As the Yadava dynasty seeks to escape the tyranny of Jarasandha, the three siblings, Krishna Govinda, Balarama Vaasudeva, and Subhadra must take it upon themselves to save the city from the tyrannical king. 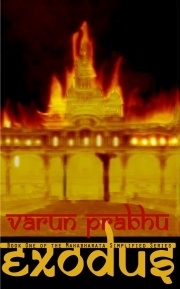 Varun Prabhu is an author who is invested in creating mythological retellings and interpreting them to suit current scenario. He also writes fantasy, horror, science-fiction, and mild erotica. Reviews of "Exodus - Book One of the Mahabharata Simplified Series"